The VCI is incorporated into the inner film layer. 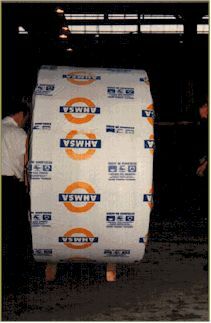 After packaging, VCI chemicals diffuse into the 'atmosphere' surrounding the coil, preventing the onset of corrosion and maintaining the steel in perfect condition. When only a single layer of VCI-containing film is used, half of the VCI diffuses outwards, into the air, and is lost. 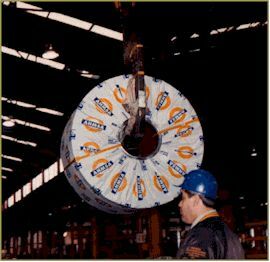 Bags are supplied in a variety of sizes to suit the steel coils produced by any steel plant. Above, one side has been finished. The operator on the left is about to remove the service tool and insert the inner fiber protector. The fiber protector is tested to support 20 tons without breaking. Like the bag, it also contains VCI.